Imagine you’ve been invited to a trendy new restaurant. Inside, the ambiance is warm and the food smells incredible. Shortly after ordering, a plate of piping-hot pappardelle is brought to you by a friendly waiter. The sweet and savory aromas linger. You can’t wait to dig in—but stop. What if you were told that the waiter who served the food was HIV positive? Would you still eat it? What if it wasn’t just the waiter who was HIV positive, but also the chef who cooked, handled and plated the food? The reality is, HIV is as shrouded in stigma today as it ever was. In a perverse turn of events, once the disease became manageable through medication, it wasn’t newsworthy. Attention and community support for those living with HIV all but disappeared. Casey House, a global leader in HIV/AIDS care, wanted to regenerate meaningful conversation that would help smash HIV stigma. But how could one organization in Ontario, with a small $35,000 media budget, create enough noise? To get attention, they had to force the issue, get people talking, and find a way to amplify their voices. Making someone aware of their own biases, however uncomfortable, gives way to more open-minded debate and empathy. To understand the most prevalent misconceptions surrounding HIV, the team conducted proprietary research and discovered that fear was the common denominator. Canadians didn’t understand how the disease was transmitted. Food, in particular, was a hot button. 50% of Canadians wouldn't knowingly accept food prepared by someone HIV+. 37% of Canadians wouldn't share food with an HIV+ person. 70% of Canadians would be nervous to share an HIV+ diagnosis openly. Not surprisingly, the team wasn’t able to find a single Canadian chef who was open about being HIV positive. Knowing how inherently conversational sharing a meal can be, the team believed creating a controversial experience involving food would be a powerful catalyst for exposing stigma. 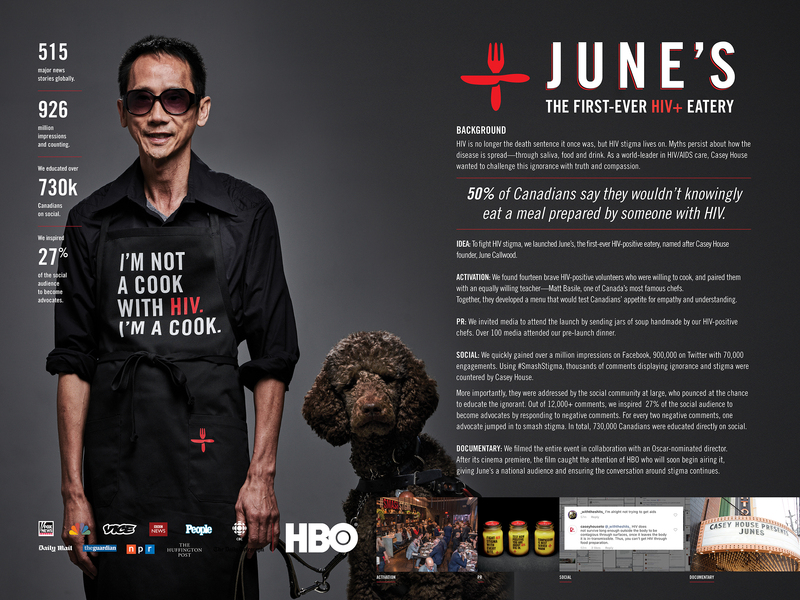 To elevate social consciousness and incite debate around the stigma surrounding HIV, June’s Eatery was launched, a pop-up restaurant staffed entirely by 14 HIV-positive Canadians who were trained to become chefs. To make the campaign as visible as possible, the eatery was opened to the public for three days on a busy, downtown Toronto street. Media were able to interview the participating chefs and a supporting documentary film helped humanize them, instilling a personal connection. The chefs, who came from all walks of life, helped dispel stereotypes about who has HIV in Canada today. Participating celebrity chef, Matt Basile, helped drive attention amongst the media and his 65K social followers within the food community. Social media is where stigma and ignorance run rampant, and where the team expected to see the most backlash and intolerance. especially towards the HIV+ chefs. Rather than shut it down, however, the negativity was harnessed to the organization’s advantage by engaging the online community to rally in support. The internet was scrubbed for thousands of ignorant comments, which were countered with myth-busting facts, amplified through the campaign hashtag #SmashStigma. Community moderators, backed by physicians, worked 24/7 to respond directly to thousands of comments and drive awareness and education. The journey of the chefs and the experience of June’s was captured by an Oscar-nominated documentarian who created a deeply personal film about stigma. June’s Eatery generated global attention. 515 stories drove 926 million impressions in top-tier outlets including The Guardian, NBC, Global, VICE, Huffington Post, Canadian Press and People Magazine. 100+ media attended the launch event and 300+ people attended the three-day event, raising $100,000 for Casey House. The social campaign garnered over a million impressions on Facebook, and 900,000 impressions on Twitter with 70,000 engagements—directly educating 730,000 Canadians. From 12,000+ comments, 27% of the audience became advocates for the cause by responding to negative comments. For every two negative comments, one advocate jumped in to smash stigma. And HBO found the documentary so affecting, they decided to distribute it nationally in 2018, expanding the audience exponentially.